The better-late-than-never Verizon HTC One is releasing this month with Android 4.2.2, making many owners of the phone's premium Developer Edition upset that they're stuck with Android 4.1.2. "How is it possible that the Verizon One will launch with 4.2.2 when us Dev Edition buyers are still stuck on 4.1!? Frustrating!" tweeted one of those irritated owners, Joshua Wein. Turns out, Jason Mackenzie, president of global sales at HTC, was listening and actually responded with some good news for Wein and all HTC One Developer Edition owners. It'll have stock Android 4.3: Jelly Bean soon. "We definitely care and want you to have a great experience. [4. ]2.2 is minor update so decided to go straight to 4.3," tweeted Mackenzie. Giving extra reason for skipping Android 4.2.2, he added "because 4.3 is so close. And 2.2 offered limited customer benefit." 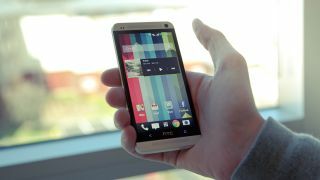 HTC One Google Developer Edition owners are missing out on features like Photosphere, Daydream screensavers, Swype-like gesture typing and multiple user profiles. However, these features will soon be joined by the benefits of Android 4.3 including Bluetooth low energy support, restricted profiles and autocomplete on dialpad. The wait won't be too long, either. "Our plan/target (since certification is necessary) is that all U.S. skus will be updated before September end," announced Mackenzie on Twitter. "Our target is before Sept end. I am pushing this one and hope it can be earlier. But sometimes unknowns can arise." Paying a premium for the HTC One Dev Edition smartphone does have its perks... eventually. Read our review of the Nexus 7 tablet, which launched with Android 4.3.